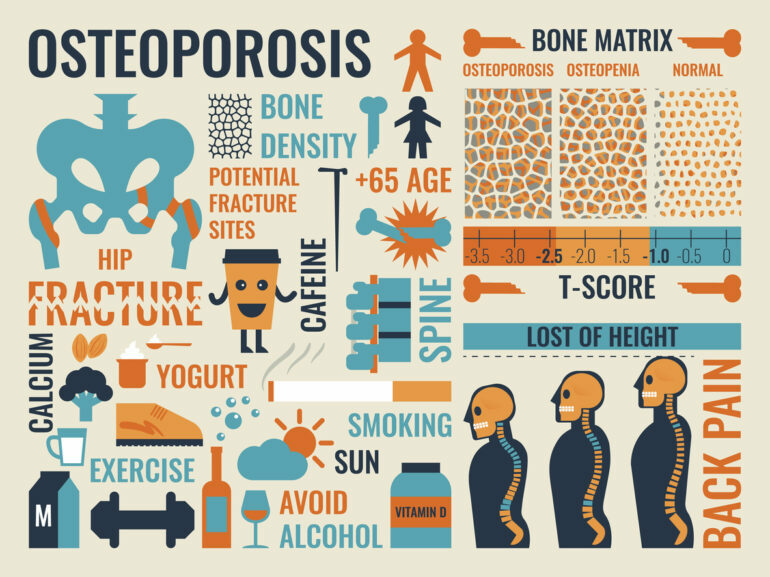 Like with any other condition, the best way to deal with osteoporosis is through prevention. Why? Well, there might be several ways to treat osteoporosis but once you have contracted the disease, there is no cure for it. A proper diet plays an important role in the prevention, and you want to focus on a few areas. Calcium, for example, is one of the most important minerals your body requires for a proper daily function. When it comes to our bones and our teeth, calcium plays a quintessential role in maintaining their strength and health. However, studies have shown that people are just not getting the required amount of calcium the body needs, and in turn, your system will drain the calcium of your bones in order to provide the needed calcium for the other functions of your body. For that reason, it is of the utmost importance that you meet the required intake of calcium on a daily basis. You accomplish this by adding certain foods to your diets, like milk, yogurt, and cheese. You can also find enough calcium in vegetables like kale and broccoli. Fish and Nuts are also a great source of it, as well as enriched foods. Something you need to keep in mind is that just like there are plenty of foods you can add to your diets that would help you increase the amount of calcium entering your system, there are certain foods that would do the opposite, and they would actually interfere with the absorption of calcium by your body. For example, there are phytic acids like ones in unleavened bread, seeds, grains, and beans. There are also oxalic acids which are found in spinach, and of course, sodium a long time enemy of calcium, this is because when there are high levels of sodium present then the body ability to absorb calcium will be interrupted. So, bear in mind that the higher the levels of sodium in your body, the higher your intake of calcium has to be to meet the required amount. So you want to consider lowering your intake of sodium. Any doctor or nutritionist will provide you with multiple diets that would help you keep your calcium levels high. Something you should the mindful about is that Vitamin D happens to be a necessary player in the capacity your body has to absorb calcium, and you can get vitamin easily to being exposed to sunlight for short period of times, as well as through supplements and certain foods.